I thought I would start by mentioning the upcoming lecture by Paul Bennett, the Centre’s Visiting Professor, where he will give an insight into his work as an archaeologist in Canterbury and far-flung places such as Libya and Iraq. Do come along if you are interested, the lecture is free and will take place at 7pm on Tuesday 12 December in Old Sessions House, Canterbury Christ Church. It is always interesting to hear what various members of the School of Humanities are doing in terms of Kent History and Heritage and I happened to see both Dr Lesley Hardy and Dr Mike Bintley recently who said their joint project on ‘Finding Eanswithe’ is coming on well. This means they will be putting in a Heritage Lottery funding bid very soon. I’ll let you know how this progresses during 2017. I also saw Professor Louise Wilkinson, who told me she had recently been to a meeting of the organising committee of the ‘Medieval Pageant’ in Canterbury. As readers of the blog may remember, the inaugural pageant back in the summer had been very successful. Consequently, it is proposed that in 2017 the pageant will take place over two days and the procession will be on the Saturday at a slightly later time to allow more people to be involved. This sounds very sensible and hopefully should draw in an even larger audience. Canterbury Christ Church will again organise activities at Canterbury castle and Louise is beginning to think what would be appropriate in terms of a royal Norman castle. Again, I’ll let you know how this progresses. These are not the only people I have seen this week and yesterday I managed – just – to attend two lectures, the first at the University of Kent, the second at Christ Church. Professor Robert Tittler was the speaker at Kent. He is a Distinguished Professor of History Emeritus at Concordia University, Montreal, and has written extensively on early modern English painting and painters including The Face of the City: Civic Portraiture and Civic Identity in Early Modern England (2007) and Portraits, Painters, and Publics in Provincial England, 1540-1640 (2012). I have met him a couple of times before and always enjoyed his work, and yesterday was no exception. I do not have sufficient space to give a detailed evaluation of his paper, but I think it is worth noting a couple of particularly interesting features that relate to his case study of John Kaye of Woodsome in Yorkshire. As Robert noted, the idea of portraiture in Elizabethan England underwent a number of cultural changes at this time in terms of self-fashioning using heraldry, genealogy, gesture, biblical references, and accoutrements. Moreover, the interplay of text of image was similarly viewed as important, and having studied Anne Clifford’s ‘Great Books of Record’, as well as her ‘Great Picture’, it is clear that such ideas continued to have currency into the seventeenth century. But to return to John Kaye, his portrait panels (dated 1567/8) demonstrate how portraiture was being used by those below the nobility who aspired to at least break into this privileged sector of society. Although relatively crude in terms of execution, the four panels, two for John and two for his wife Dorothy, use several interesting features such as rhyming couplets in the inscriptions to portray what he believed were the attributes of a gentleman and those of an ‘honest’ wife – hospitality, moderation, loyalty and piety. In addition, there are lists of their kin and friends, thereby placing the family within respectable Yorkshire society at a time when men like John were becoming more visible as JPs and other local government officials. Thus, the interplay between author and audience for such portraits in the public space of the hall rather than the more intimate space of the parlour or chamber offers insights into John’s (and Dorothy’s) expression of their place in society on the eve of the Northern Rising. Such ideas are extremely interesting but, unfortunately, I was unable to stay for the questions. The Friends of Canterbury Archaeological Trust lecture at Canterbury Christ Church by Tim Tatton-Brown was a celebration of the Trust’s first decade when Tim was the first Director. 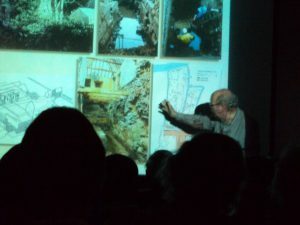 Paul Bennett, the current Director, with several members of Trust staff had compiled a PowerPoint for Tim that highlighted the most iconic excavations undertaken during his tenure. They had also found photos of many early CAT staff, including those who has been instrumental in forming the Trust and keeping it going in its early years. Among the early excavations were several investigations in the grounds of Canterbury castle, a particularly contaminated site (heavy metals from the late gas works) but one that yielded some spectacular finds, including the burials of two Roman soldiers with their swords. Tim and his team also worked at St John’s hospital in Northgate, several sites in the cathedral precincts such as Meister Omers, the archbishop’s palace – second only to Westminster Hall, and the almonry buildings with the Norman staircase. Tim and William Urry, the cathedral archivist, worked together on the pavement where Becket’s shrine had been, and by careful observation were able to produce a plan showing its extent and likely form, a remarkable achievement. Equally impressive was Tim’s contribution to the exploration of St Augustine’s Abbey, and in this case he worked on the documents with Mrs Sparks, who has recently retired as the cathedral’s honorary historian. Tim was also keen to record his thanks for all the work of people such as Lawrence and Margery Lyle, who still take a keen interest in CAT’s activities, as well as many others who are no longer around. Thus, he treated his audience to a tour de force that kept everyone’s attention for well over an hour. Although not dealing directly with text and image, Tim’s lecture did feature aspects of material culture, and to finish I thought I would just bring these ideas together in a consideration of an inscription at William Browne’s hospital in Stamford. I’m using this Lincolnshire example because Kent has nothing comparable. In some ways, the use of portraiture (in brass) and his statue above the gateway offer relatively conventional markers of Browne as founder, but it is the activities of his brother-in-law Thomas Stokes, a canon at York, that I think are more interesting. The Latin verse inscription on the wall just inside the hospital’s gateway at the bottom of the stairs to the first-floor audit room [antiquarian scholarship says there was a tradition that this was the work of Thomas Stokes] records the desire that this charitable house shall flourish forevermore. In part, this is a consequence of the prayers its foundation will invoke, presumably by those inside, but potentially also from those outside; that is anyone who reads/hears the inscription. 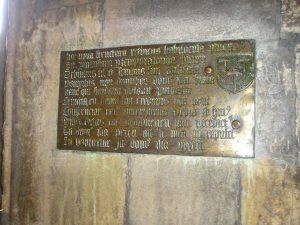 Thus the inscription’s composer sets up a 3-way relationship: author [Thomas], founder [William], beneficiary [almshouse], through the construction and placement of the inscription, the naming of Browne as founder, and the invocation of the almsfolk to commemorate him using the ideas of memory and offering. As a result, Thomas’ primary gift of patronage, placed him alongside his brother-in-law and so at least equally worthy of commemoration, his position reinforced by his activities as the producer of new regulations and his self-appointed role of overseer of the hospital. Such case studies highlight the value of microhistory, an approach that has been used to good effect by many who have studied aspects of Kent’s medieval and early modern history.